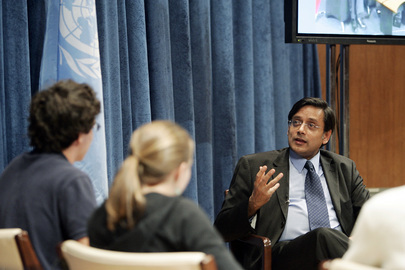 Shashi Tharoor (right), Under-Secretary-General for Communications and Public Information, is interviewed by New York students at the video conference "Talk Back Classroom" on the role of the UN in the world, hosted by moderator Steven Cutting. Mr.Tharoor was interviewed by two panels of three students each, one in New York and the other in Canberra, Australia. Panelists also explore how the United Nations is portrayed in the Media.